A trip to Seneca Falls contains neither a view of Seneca Lake nor a waterfall. But the town is charming, full of stories and I discovered one almost as soon as I entered town with an eager female friend in the back seat of my car. I was dog sitting, and Maori, my traveling companion was eager for an explore. We saw signs for a “Sculpture Trail”, and followed them to a quiet parking spot with signage directing us to cross the road to begin the trail. The Ludvico Sculpture trail has a name more auspicious than it is. 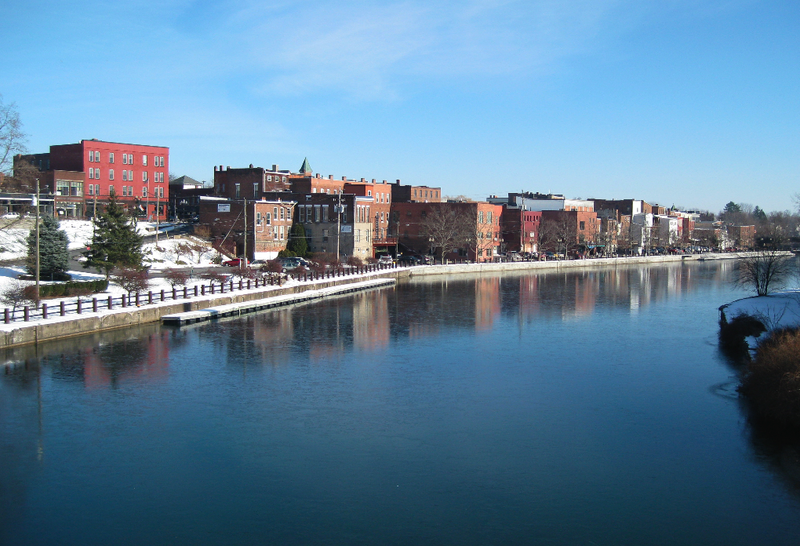 But it is perfect for the downtown of Seneca Falls. It can be used for hiking biking, X-country skiing, or dog walking. What I liked about the trail the most was the great view it provided of the downtown area via the canal that runs right through town. The Trail begins at the south end of the Bridge Street in Seneca Falls. 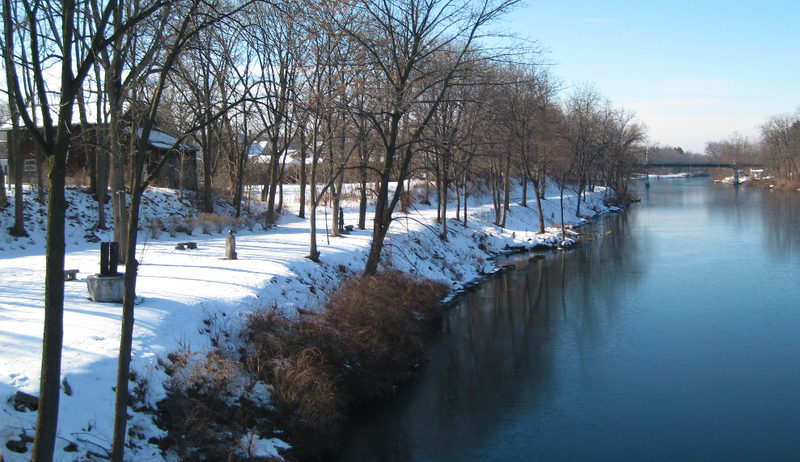 The wide, level path, which dead-ends at Sucker Brook, overlooks a stretch of canal between Cayuga and Seneca Lakes. What was once an abandoned railroad bed has been transformed into a scenic trail with original sculptures. 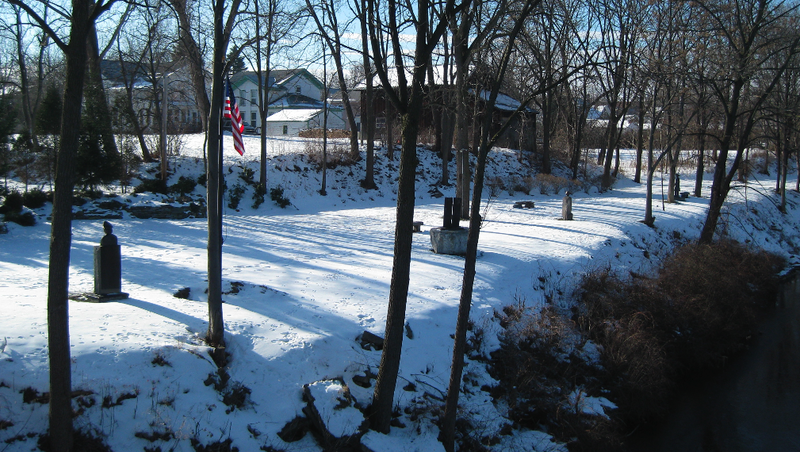 Eight sculptures have been installed along the trail with themes that align with Seneca Falls: the Women’s Rights Movement, the canal, and Goulds Pumps. Masterminded by Wilhelmina Pusmucans, and opened in 1999, it was made possible by a generous gift by Frank J. Ludovico. 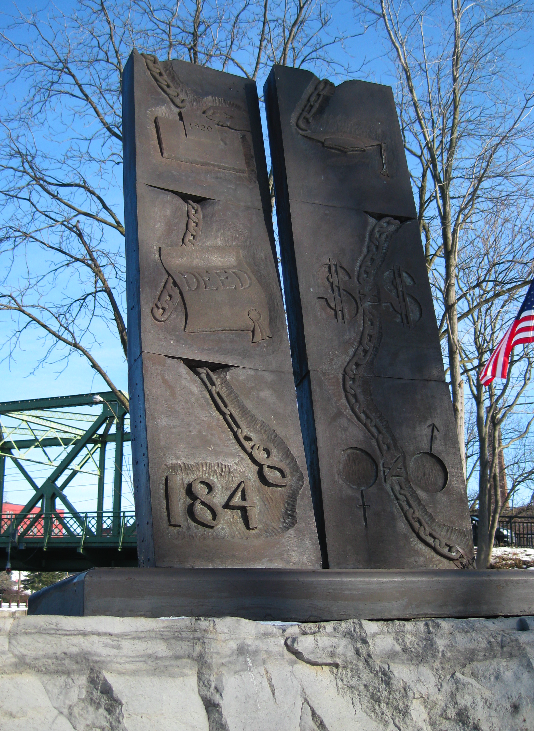 The trail’s first sculpture, named “The Status of Women” shows two large tablets with carved chain links six symbols, representing the right to vote, the right to hold property, the first Women’s Rights Convention, the right to higher education, equal pay for equal work and fair and equitable divorce laws. 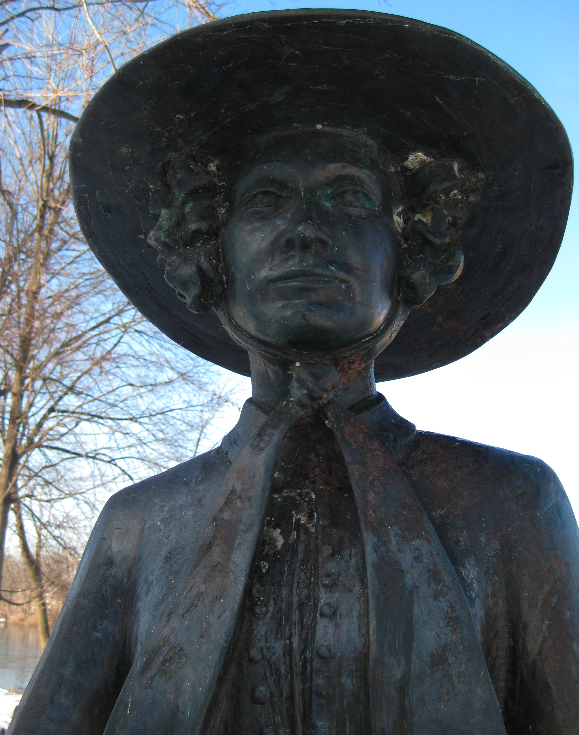 Next a sculpture of Diana Smith, commemorates her as the first female mayor of Seneca Falls 2004. There is a sweet sculpture commemorating Amelia Bloomer, perhaps best known for the “provocative” trousers she wore under her skirts. She was the nation’s first female newspaper publisher. The Lily, which began in 1848 in Seneca Falls, became a voice for advocates of women’s interests. Right at the waterside are a pair of canal diggers, to pay tribute to the immigrants who were critical to the building of the canal. Further down is a towering metal abstract of figures called Bacchus — a link to the area’s wine industry. 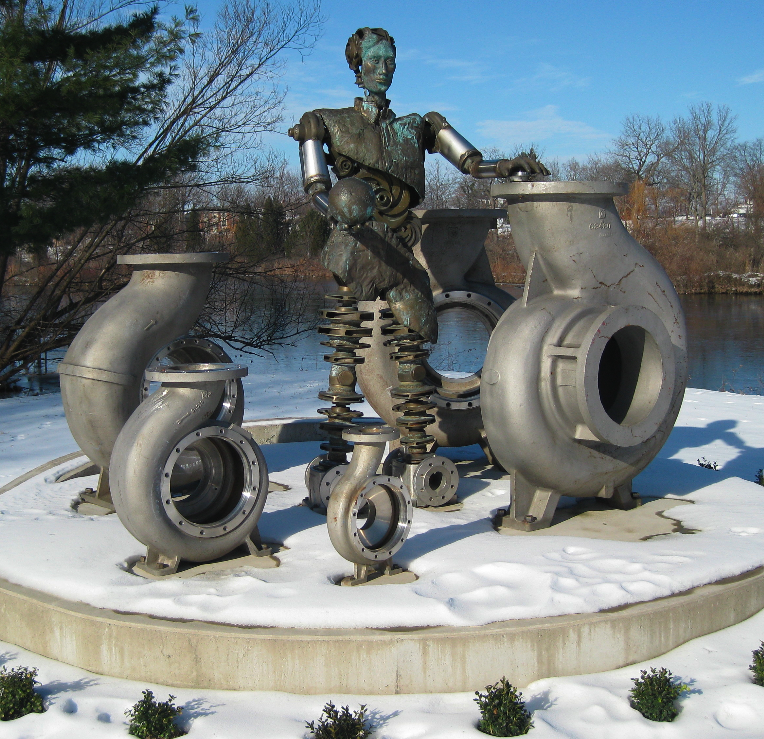 Lastly is “Working Man’s Alchemy”, one of the oddest sculptures I have ever seen, combining a human form with parts of the pumps, sponsored by Goulds Pumps. "Help! My feet are frozen!" 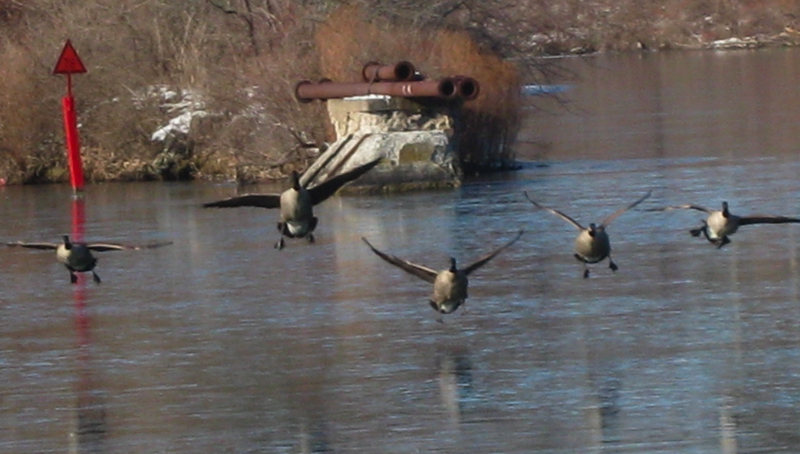 While I was walking, I noticed a group of geese trying to land on the surface of the canal. The water was so glassy they did not realize that it had frozen. As they touched down they wiped out on the ice amidst indignant honking. There was one lone geese standing on the other side of the canal with its feet frozen in the water. I hope someone came along to help him loose his feet from the ice. To help raise money for ongoing support of the trail, Hill Winery in Romulus has bottled a Cayuga White wine with a Ludovico Sculpture Trail label and gives a percentage to the sculpture trail. For information on the sculpture trail, call 315-568-8204. Tax-deductible donations may be sent to Friends of Ludovico Sculpture Trail, P.O. Box 0566, Seneca Falls, NY 13148. Entry filed under: Activities, Art Galleries, Biking, Cross Country Skiing, Diana Smith, Frank J. Ludovico, Goulds Pumps, Hiking, New York, Seneca falls, Seneca Lake, Wilhelmina Pusmucans, Working Man’s Alchemy. Tags: Amelia Bloomer, Frank J. Ludovico, Ludvico Sculpture Trail, Seneca Falls.